Hey! Sorry I’ve been absent for so long, over a week. We’ve had a whirlwind month. We have one kid in softball and one in t-ball, so we’ve had practice and/or games almost every day for the past week and a half or so. Plus we’re back in our homeschool co-op, etc., etc. And I’ve actually been going to bed at a reasonable hour, so that means no blogging. 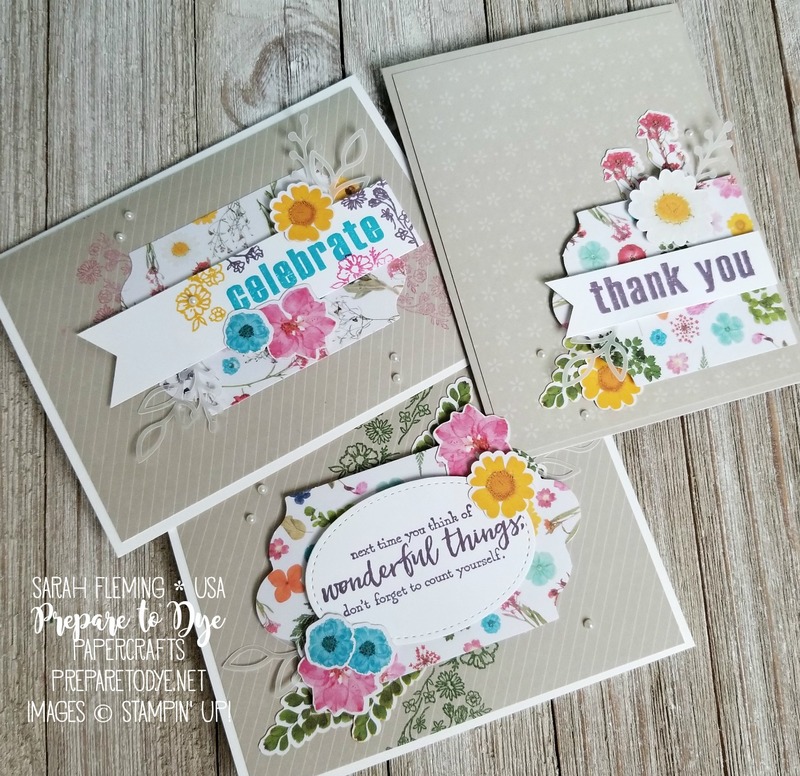 Expect me to continue being sporadic until after Stampin’ Up!’s OnStage convention in early April. I’m guilty of letting those Paper Pumpkin boxes pile up and doing them months later (anyone else out there??). 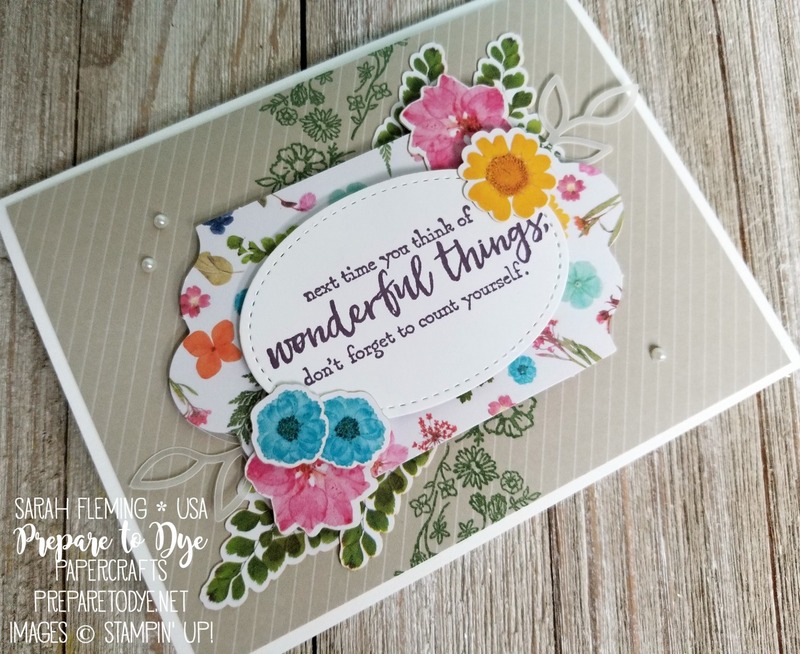 But I loved this month’s bright colors and delicate flower stamps so much that I got it out and played with it right away. 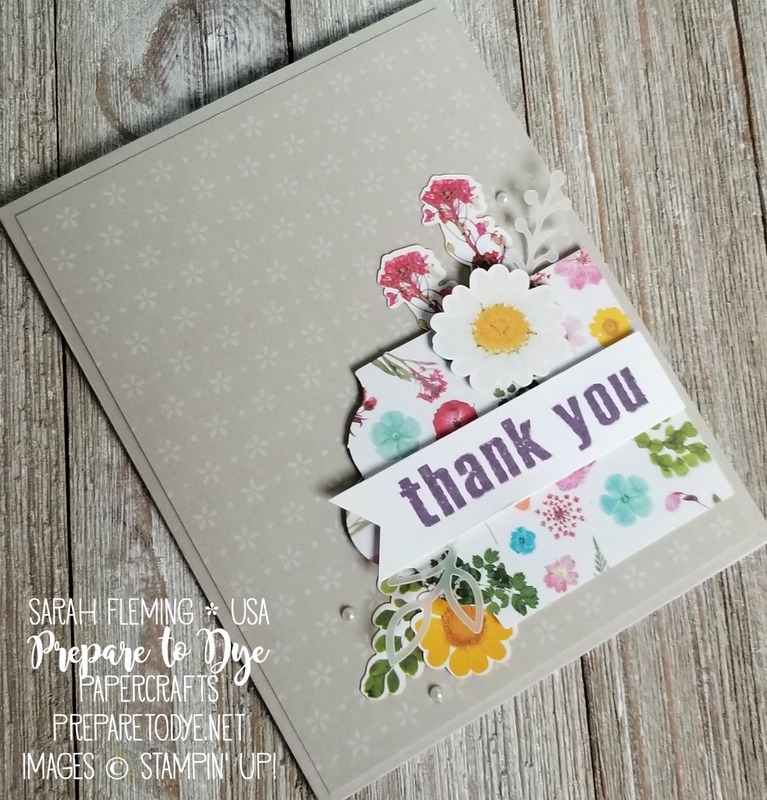 This kit contains supplies for 9 cards and includes 9 envelopes lined with gorgeous wildflower paper (I would very much like a whole pack of this paper — it’s GORJ.) First I made one of each of the cards as intended in the kit. Then I played around with it. These are the cards in the kit. You would make three of each. But I only made one of each. I love these cards as they are, but I really like more contrast than this in my cards, so I knew I had to change things up a little. This is my first alternate project. 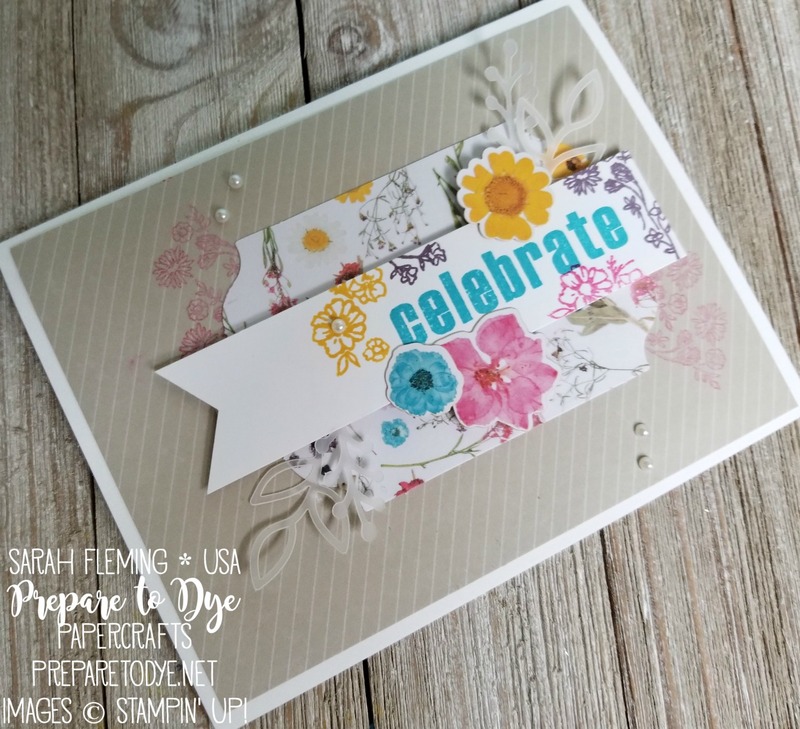 I swapped out the Sahara Sand card base for a Thick Whisper White base, used the patterned paper as a background, stamped flowers from the kit stamp set in Melon Mambo ink on the background, used the wildflower label (heart eyes emoji), stickers, and vellum cutouts from the kit, and made the sentiment label using Whisper White cardstock, stamps from the kit, the Banner Triple Punch, and ink in Crushed Curry, Tempting Turquoise, Perfect Plum, and Melon Mambo. I’m not sure why, but this is my favorite of my alternate cards. Everything except the label is from the kit, and for the label I only added Whisper White cardstock, Perfect Plum ink, and the Banner Triple Punch. 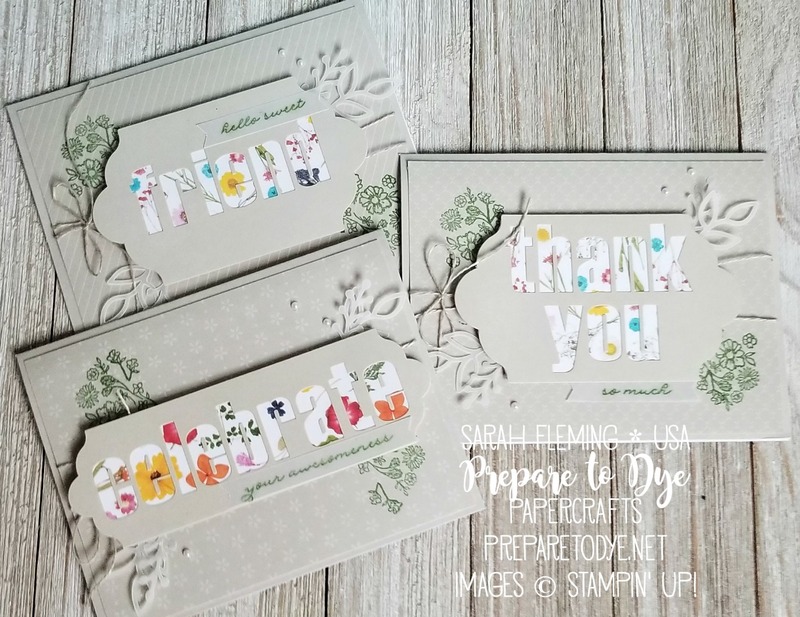 My last alternate uses the kit plus a Thick Whisper White card base, Whisper White cardstock, the Just Add Text stamp set, Perfect Plum and Garden Green ink, the Big Shot, and the Stitched Shapes framelits. This may be my all-time favorite Paper Pumpkin kit! 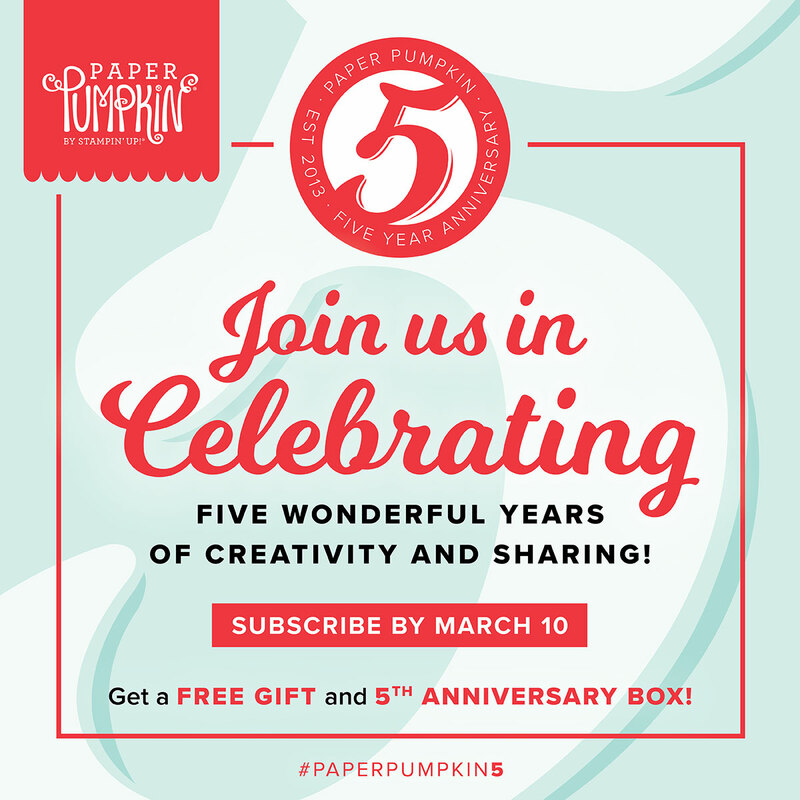 Paper Pumpkin is turning 5 this month! And the March kit will have a free gift included and a special box. If you’d like to get in on the March Paper Pumpkin, you can subscribe here before March 10th or buy a prepaid subscription in my online store. If you buy a 3-, 6-, or 12-month prepaid subscription, you get to choose at least one free Sale-A-Bration item!